JFNA's Israel office has produced this final comprehensive summary of the Israeli elections (attached and below), designed specifically for Federation audiences. The document outlines the main issues, coalitions, polls, and possible scenarios. Elections in Israel will be held on April 9, 2019. As always, under the Israeli system, the public will elect the full 120 members of the Knesset. In turn, the new members of Knesset will elect a governing coalition from its ranks, including a prime minister. For a full explanation of how Israel’s elections work, please see JFNA’s Israeli Election Primer.  The two contenders to lead the country after the elections are current Prime Minister Benjamin Netanyahu, and Former IDF Chief of Staff Benny Gantz.  If Netanyahu wins, it will be his fifth (fourth consecutive) term as prime minister. Netanyahu was first elected in 1996 and has spent a total of 13 years as the country’s head of government. If reelected now, he will shortly become the longest serving prime minister in Israel’s history.  Benny Gantz, a popular formal general who has not yet served in the Knesset, leads a new centrist party known as Kachol Lavan (Hebrew for Blue and White) which is an amalgam of Yair Lapid’s Yesh Atid Party, a new recently formed party initially known as Chosen Israel (Israel Resilience), and Moshe (Boogey) Ya’alon’s Telem Party .  Historically, almost every election in Israel’s history has been fought over the linked issues of security, defense, the peace process and diplomacy. Less frequently debates over how to run the economy have played a secondary role, as have social welfare questions. However, in the current elections, none of the above issues has been discussed in any serious or extensive manner.  Remarkably, for a country with so many security and diplomatic challenges, one of the only real issues that has been debated these elections has been the possibility of legalizing cannabis.  Instead, the elections have focused far more on personalities including the suitability of the parties’ leaders to run the country.  There is a common misconception that the leader of the party that wins the most seats in an Israeli election will automatically become prime minister. In reality, the winner of the election will ultimately be that person who gains the support of the majority (at least 61 out of 120) of the members of the newly elected Knesset.  As a result, in addition to the individual strength of the major parties, during the campaign it is important to note which parties are publicly declaring their support for which leaders.  Current Prime Minister Netanyahu, the leader of the Likud party, entered the race as the clear favorite. Despite a large section of society that dislikes him – even intensely – the prime minister remains a highly popular figure among many sectors of Israeli society.  It has been said that Israelis ultimately care about three issues: Security, the economy, and foreign policy. And to many, the country has never seen a more successful leader in all three of these areas than Benjamin Netanyahu.  Despite this, the current elections are also being held under the shadow of the police investigations into the prime minister. The attorney general has announced that he plans to indict Netanyahu for offences including corruption, and that announcement, less than two months before the elections, was a considerable blow to the Likud leader. However, by law, a public figure is entitled to a formal Pre-Indictment Hearing before a final decision on whether to indict is made. (A final decision on an indictment is likely still a year away).  Netanyahu has repeatedly stated that there is no substance to the allegations against him, and that as soon as he is given a chance to explain matters in a hearing, he believes the indictment will not proceed. By law, a prime minister does not have to resign until he or she has been convicted by a court, and exhausted all possible avenues of appeal. Despite this, if a prime minister was indicted, public pressure to resign would become very strong.  The Likud list of candidates includes a large number of experienced and popular politicians, but, there is no one who comes close to rivalling the support that the party’s leader enjoys.  Habayit Hayehudi (The Jewish Home) has split into two, with its popular former leaders, Naftali Bennett and Ayelet Shaked leaving to create their own party, known as the New Right. Unlike the original, the new party is aiming to attract both religious and non-religious voters.  The Jewish Home still maintains a highly committed base of traditional supporters. Nonetheless, the original party was in some danger of not making it over the electoral threshold after the split (in Israel, any party that does not win at least 3.25% of the votes is automatically disqualified and the votes that it did win are discarded), meaning the party would not be in the next Knesset. To avoid this scenario, Bayit Yehudi has joined forces in what it refers to as a “technical block” with the far-right Otzma Yehudi which is led by supporters of the late Rabbi Meir Kahane.  The new combined party, known as the United Right, have said they would break away from each other immediately following the elections. Prime Minister Netanyahu has been sharply criticized for encouraging this union, and has been accused of enabling Kahanists to enter the Knesset. (One of the members of Otzma Yehudit was later banned by the Supreme Court from running due to racist remarks he had made).  Both United Torah Judaism (UTJ), the haredi Ashkenazi party, and Shas, the haredi Sephardi party, maintain their traditional bases of support; although Shas’ numbers have decreased in recent years due to internal infighting.  Current finance minister Moshe Kahlon’s Kulanu Party has also dropped in recent polls. With massive price rises of late, the success of his four years as finance minister is being questioned. Similarly, Avigdor Liberman’s Yisrael Beitenu has weakened. Both of these parties are in some danger of not reaching the mandated electoral threshold.  Perhaps the most interesting party currently standing in the elections is Moshe Feiglin’s Zehut Party. Feiglin is a former Likud member of Knesset who is considered far right on many issues related to religion, security and foreign policy. Despite this, he is strongly liberal on a number of issues, and it is he who has pushed for the legalization of cannabis. Even though it would seem that Zehut would naturally support Netanyahu over Gantz, Feiglin has repeatedly stated that he has no preference between the two.  Current Member of Knesset Orly Levy, who left Avigdor Liberman’s Yisrael Beteinu party a few years ago, established a new party called Gesher, (named after the party of her father, former Likud foreign minister David Levy). The party is focused on social welfare issues, but is currently polling under the electoral threshold.  Two Arab parties are likely to be elected to the Knesset: Hadash - Ta’al as well as Ra’am-Balad. Historically, Arab parties have never supported one prime ministerial candidate over another, meaning that neither side can count on their support to reach a majority in the Knesset. For a detailed description and analysis of voting in the Arab sector, see here.  After years where many figures tried unsuccessfully to form a united opposition to Netanyahu, former IDF Chief of Staff Benny Gantz has managed to create a strong union, known as Kachol Lavan.  Gantz has joined forces with the centrist Yesh Atid Party (led by the experienced politician Yair Lapid) as well as two other former IDF Chiefs of Staff: the popular Gabby Ashkenazi and former Likud defense minister, Moshe (Boogey) Ya’alon. Gantz and Lapid have agreed that if they win the election, Gantz will be prime minister for the first two and a half years, following which Lapid will take over until the end of the term.  The three generals plus Lapid are joined at the top of the new party by outgoing Histadrut (national trade union) leader Avi Nissenkorn.  Though there is a comprehensive written platform, Blue and White’s leaders have not articulated many policies, and stances on some issues remain unclear. The party has tried hard to present itself as centrist, but the Likud has campaigned strongly to paint Blue and White as “left.” The party’s candidates include figures from the fairly firm right as well as the strongly left.  Since the combined party was launched in February, it has frequently polled more seats than Likud, the first time that a party has done this in many years.  Labor is one of Israel’s two traditional “large parties,” along with Likud. Nonetheless, under the party’s relatively new leader Avi Gabbay, Labor has seen its polling numbers plummet from 24 seats in the current Knesset to around 8-9 in recent polls.  Meretz, further to the left than Labor, has maintained a relatively small but loyal following for many years. New leader Tamar Zandberg has not succeeded in attracting significant numbers of new supporters.  If the parties supporting Netanyahu manage to win more than 61 seats, then Netanyahu will likely remain prime minister and build a coalition that is very similar to the current, outgoing government. o Following his “defeat,” Netanyahu could quit politics and a new Likud leader could enter a Gantz-led government. o Gantz could go back on his promise not to sit with Netanyahu in government, and could form a national unity government with him (perhaps with an agreement to rotate prime minister between Gantz and Netanyahu after two years). o Gantz could possibly become prime minister by persuading some of the more moderate parties on the right (who support Netanyahu) to join him in government instead. (Possible, but unlikely). o Gantz could possibly become prime minister by persuading the Arab parties to join him in government. (Possible, but very unlikely). o Failing any of these outcomes, if no leader can form a coalition of 61 or more, then new elections would be held.  Israel Votes 2019- A comprehensive, well laid-out resource.  JTA's Election Guide (including short articles on many topics). 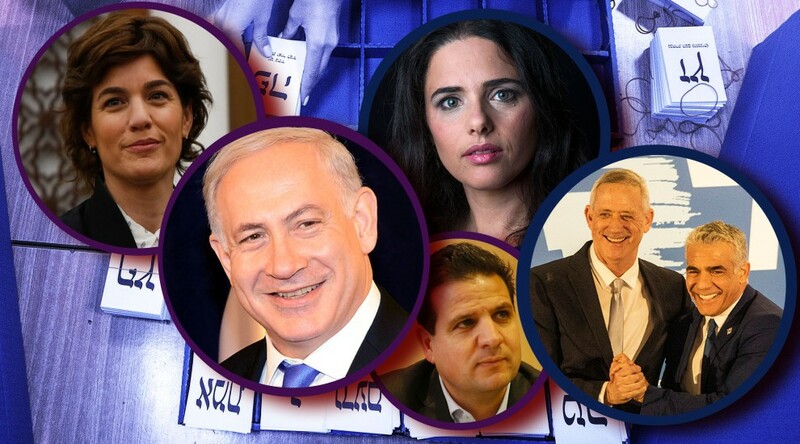  The Jerusalem Post's 2019 Election Guide. (Sources: Israel Radio, The Jerusalem Post, Ministry of Foreign Affairs, Israel Democracy Institute, The Times of Israel, Israel News Channel, Galei Tzahal, Ha’aretz, Yediot Acharonot, Walla! News, plus web sites of individual political parties).